Hard fighting, acrobatic and challenging to any angler of any age and skill level. The tarpon has it all by way of sport fishes. Fishermen travel all over the world in pursuit of these incredible pre-historic fish to have a shot at catching one. 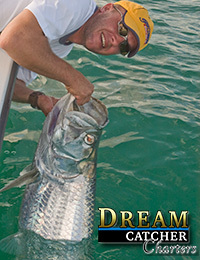 Come to Key West, Florida for the best in tarpon fishing anywhere in the world. Since 1994 anglers have been fishing with Dream Catcher Charters for the best chance at landing one of these amazing fish. All while using some of the nicest fishing gear on board the nicest boats in Key West with experienced professional fishing guides. A great time for reef and backcountry fishing. Tarpon fishing is ramping up and we are starting to see many tarpon. Backcountry and Flats are great with bonefish between the cold fronts. The permit fishing is still very good. Reef fishing Grouper season is closed till May 1st. Yellowtail and mutton snapper fishing is awesome. Add Mangrove snapper for a complete box. Deep sea fishing Big mahi mahi on the trolling trips with sailfish and wahoo. A great time of the year for deep sea fishing. Can be a little rough. Our trips are all about our anglers. 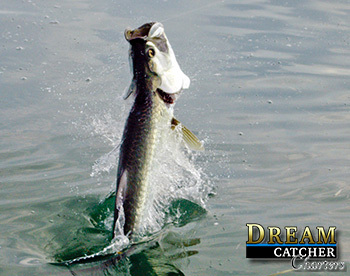 We focus on ability and meet that with professionalism and great fishing. The coaching and customer service you will get from us is second to none and our equipment is impeccable - Always. Our fishing guides are very experienced and friendly. We guarantee it with a money back policy. Fish for tarpon with us using light tackle spin fishing rods made by DAIWA or fly fishing equipment made by Orvis, G-Loomis and Sage. Our boats and equipment are guaranteed to be in excellent if not New condition, with new line, hooks, lures and flys. We offer 4, 6, and 8 hour tarpon fishing charters. With boat rides from 5 - 30 minutes we are in the tarpon in no time so we recommend 4 or 6 hour trips. We carry 1- 4 persons on our backcountry tarpon fishing boats. Most of our trips fish on board our bay boats. A We also have traditional flats fishing boats you can request. You will find our rates to be very competitive with other outfits here in Key West. Check out our rates page to see what the current cost of a tarpon fishing charters with us will be. Our bookings for tarpon season sell out every year. Traditionally our tarpon season is most consistent in the spring. The migration begins in late April and carries on through the month of July. These fish are commonly known as "migrating tarpon" and show up here in Key West by the thousands, hungry from their long trek. Dates for these charters to fish the migrant tarpon fill up fast sometimes a year in advance so book as soon as you know when you will be in Key West. Check Out Our Key West fishing seasons page for lots more information. However.... Here at Dream Catcher Charters learning from our patterns of years of fishing experience here in Key West we go fishing for tarpon year round. In our world you can tarpon fish consistently from mid January all the way through to November. Sometimes even the off months can be very good as well depending on conditions. From the slob size tarpon in the late winter to the baby tarpon in the fall and early winter we have a line on all tarpon fishing in Key West. Migrating tarpon push along the edges of the flats and channels all throughout the backcountry here off of Key West. Setting up ambush points where the flow of tarpon is thick and the fish are apt to eat is the job of your fishing guide. Thats what we do, provide our anglers with the shots to catch one of these "Silver Kings". Here in the Lower Florida Keys we have what we call baby tarpon available to our anglers. These tarpon live in areas not well traveled by most skiffs and guides. Fun on fly and super light tackle the baby tarpon trips are most productive in the Fall. They range in size from 5 - 35 lbs. This type of tarpon fishing requires advanced booking and may require the angler to travel up the Keys from Key West to Sugarloaf Key to enjoy this fishery. Brings anglers from all over the world. We offer fly fishing charters that specifically target tarpon furring the migration from May 1st through June 30th. We use either our Beaver Tail technical flats fishing skiff or our Yellowfin technical Bay Boats to target tarpon with a fly rod. Your choice of vessels the cost is the same. We supply all your fishing gear, tackle. We can accommodate 1-4 persons. Expect only the best in boats. Built to suit our needs on the water for your day of fishing. No expense spared on the tools we use to go fishing. Names like DAIWA, Orvis, Sage, All Star and G-Loomis Get an idea what we are fishing for and what you might expect in a day of fishing with us. We would like to say thanks to all the folks who beleive in us as much as we believe in thier products. Click on each sponsor and find out what we do with them and why. Offering the very best isn't hard when your working with the right folks..
Any content including images belongs to us. info@dreamcatchercharters.com Dream Catcher Charters INC.